There can be no question whatsoever that Elvis Presley was one of the most influential Americans of the 20th century. To this day, his impact as a singer and performer is monumental. He is still beloved by millions all over the world and continues breaking records with album sales. His talent, good looks, sensuality, charisma, and good humor endeared him to his fans, as did the humility and human kindness he demonstrated throughout his life. This documentary is a warm, moving and sensitive tribute to the King of Rock n’ Roll, and at the same time it is a comprehensive and detailed biography of his life. 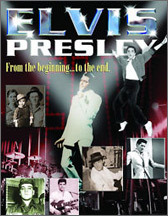 Utilizing rare footage and photos from throughout the 42 years of his life, this special follows the Presley story from his birth in Mississippi, through his rise to a superstardom that has never been equaled, to his tragic and untimely death. Featured will be interviews with musicians and music historians, as well as on-location footage of many of the places where Elvis made history.